Of the 3,749 students, 651 have qualified to join IITs. Among the state boards in south India, Tamil Nadu came last as Karnataka (24) and Kerala (23) state boards also have a higher number of students enrolled into the IIT-M this year. 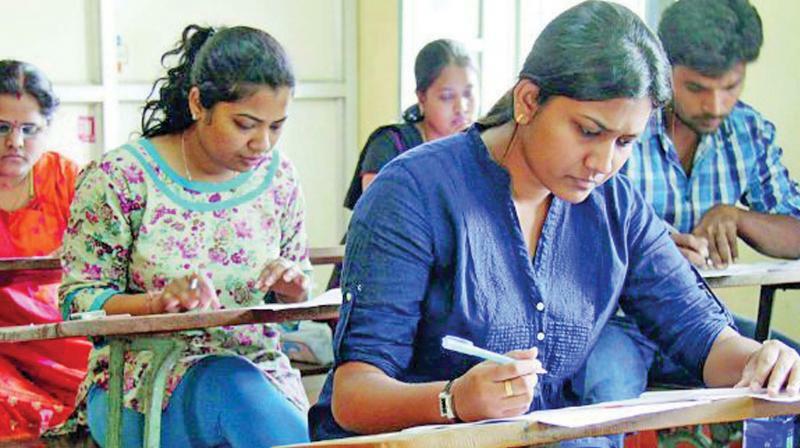 Chennai: Of 8.33 lakh students who appeared for the state board plus-2 exams in Tamil Nadu this year, only 13 students have got admission in IIT-Madras. Of 835 students who joined various undergraduate programmes in IIT_M, 313 students are from Andhra Pradesh and Telangana state boards, five more than the CBSE board. From Maharashtra state board, 100 students got admitted into the country’s premier engineering institution. “Students from these two states have motivation and aptitude to go for science and engineering stream in general. The main reason for the high number of students from these two states joining in IIT-Madras is the coaching centres,” said G. Markandeyulu, chairman, JEE, IIT- M.
“For some reason, Tamil Nadu students are lacking motivation. The number of students who appear for JEE exam is very small in the state. But in Andhra Pradesh and Telangana, the numbers are much high,” he said. For example, from Andhra Pradesh, 7,163 students appeared for JEE (advanced) and from Telangana 11,042 students wrote the exam. But in Tamil Nadu, only 3,749 students participated in the exam. Of the 3,749 students, 651 have qualified to join IITs. According to the admission statistics of IIT-Madras, out of 651 students qualified this year from Tamil Nadu, 116 students have joined IIT-Madras. Of these, Thirteen are from the state board and rest of them from CBSE. Career consultant and educationist Jayaprakash A.Gandhi said the state board students are not able to compete with their CBSE counterparts. “The state board students prepare for the competitive exams only in the last minute. Many schools do not teach the eleventh standard. If a student has to crack the entrance exam they have to be very strong in the eleventh syllabus," he added. “Even in Tamil Nadu, no student would have passed JEE by self-study. All students got admission in IIT-Madras must have had special coaching," he said. got the third and fifth rank in the Tamil Nadu Engineering Admissions have studied their Class XI and 12 in Andhra Pradesh and Telangana. The third rank student N.Barathan from Neyveli went to Sri Narayana Junior College in Nellore and the fifth rank student S.Sivaram Kiruthvik studied at Sri Chaitanya IIT Academy in Hyderabad. “In Andhra Pradesh and Telangana, students have to study only five subjects instead of six subjects in Tamil Nadu. They also focus more on the entrance exam in the classes,” said a parent.